Tristan Louis gives us 5 reasons why social networks fail and 5 reasons why social networks can succeed. I would add that social networks can fail or succeed depending on whether they attract the right type of crowd at the first place, then balance members quality and quantity. Example: if you and your friends joined a social network, only to find out that the coolest kids in your class are on another one, will you switch? Most likely because cool people will attract more cool people. This networking effect is behind the success of Linkedin, who has many members at VP level and above. So if I were to look for a job, would I go to the place where VPs hang out or just any social network as long as it has loads of functionality? I managed to get as far as the homepage. One day I hope to click on these promising maps of exotic places such as St-Martin, Wallis and Futuna or even "la France continentale". Geoportail offers closer look on France (when working). 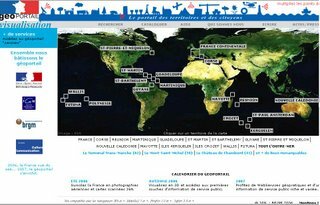 The French government launched a rival to Google Earth in France with more detailed maps and photographies of the French territory. The service, a joint project by the National Geographic Institute and the Office of Geological and Mineral Research is called Geoportail and it went down a few hours after launch due to an"unforeseen number of visitors". I wanted to use this post to question the role of public funds v. private sector for such initiatives or highlight the lack of an English translation on the temporary error message but I am in a bad mood and rather keep my praises for the actual service, when it will work. From Publishing 2.0. quoting an article from the FT where the Chief Executive of Mediavest USA admonishes Google for not putting enough branding in its search results. Google and Yahoo! push back and argue that traditional agencies and clients need a bit more "self education". I understand Mediavest's concerns: they are not making a lot of money when their clients spend their media budgets on Google AdWords v. TV or online ads. And yes, most advertisers are still in the dark as to how AdWords work. Yet, to advertisers 1.0's credits, their brand (and clickthroughs to their sites) would certainly benefit from having pictures or videos displayed in search results. Google AdSense already does that with click-to-play video ads. When searching for designer perfume, to use Publishing 2.0. 's example, I could tolerate some visual ads in the sponsored results. This is the thin line between providing me with relevant information and enticing me to click and as long as these two do not contradict each other, why not? Note of caution: I would recommend Google to test whether its users would accept seeing Google’s purist white layout turned into a billboard before wide-scale rollout…In the meantime, advertisers will have to relearn writing compelling copy. Business week ran a comprehensive article last month on Second-Life highlighting business opportunities and how companies are seeing more than fun and games when looking at virtual worlds. Harvard Business Review has an excellent article on "Marketing to Avatars"
I just caught the last half of the Italy v. US game. I usually tend to cheer for the underdogs and it is not very often that the US are underdogs but in football. They really fought it and came to a draw (thanks to Keller among others), earning a precious point to keep them in the cup. Congratulations to my american friends and readers. Now you've got a reason to watch the "soccer". The National Security Agency is funding research into harvesting information people post about themselves on social networks and online communities and could possibly combine these with other data to build extensive personal individual profiles. Sounds like a big brotherish conspiracy theory but the Centre for Research on Globalisation that published this article states the New Scientist as it sources. We know who you are hAcKEr345! I am lazy to copy it but look at ComScore Media Metrix's press release as it also includes the top 50 websites in the US per number of unique visitors. You'll need these figures the next time you try to convice a client that there is a world outside press releases. First seen at Steve Rubel's. Tagfetch retrieves and displays on one single page all content listed on various sites for the tag you are searching for. Handy time saver. Via Steve Rubel who retrieves and displays on one single blog all new applications you are searching for. Handy time saver. There has been a renewed interest in practical science recently as seen in hundreds of video clips demonstrating that if you drop a mentos into a bottle of diet coke, a natural chemical reaction occurs and turns a refreshing carbonated beverage into a spectacular geyser. The story was even featured in Monday's issue of the WSJ. Coke's reaction has not been very enthusiastic: "It's an entertaining phenomenon ... [but] doesn't fit with the brand personality of Diet Coke". I sympathise, it is a far cry for Diet Coke's more feminine and sophisticated image. But it is very entertaining. Rich Smith thinks Coca Cola should capitalise on this user generated trend instead of snubbing it. Yet another example of consumers 2.0. derailing a campaign from traditional advertisers' carefully laid out tracks. Is the blogosphere too US centric? Technorati's World Cup's tags say no. Like the World Cup, the blogosphere is becoming a global level playing field. Beyond PR is now mispelled in Franglais, Italian (Soprano style), Spanglish, Beginner's Chinese, Japlish and World Cup tourist German. Thanks to Trevor Cook who gave me this bad idea from looking at his excellent blog. Got my invite yesterday. Unfortunately, I had and have very little time to review it. 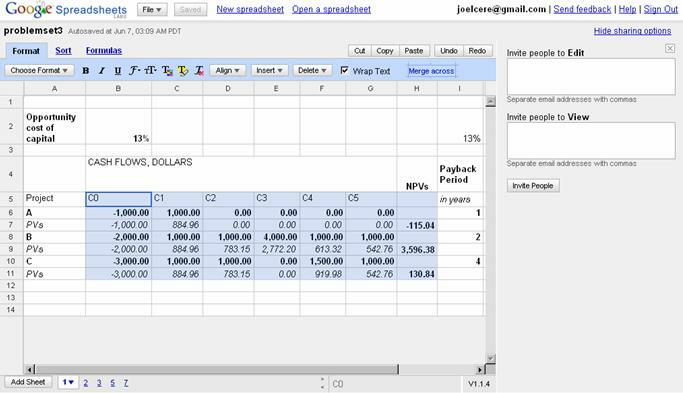 It looks to be comprehensive enough for basic Excel usage though. I haven't located the charting options yet but the sharing options are shown on the right hand side. Instead of a thorough review, I am posting a pretty picture (typical marketing guy really...). Hexakosioihexekontahexaphobia... the fear of number 666! Today is the 6th of June 2006, the 6th day of the 6th month of the 6th year... If you suffer from Hexakosioihexekontahexaphobia, the fear of number 666, you should not join thousands of bloggers who pushed 666 has the hottest technorati tag today. Unfortunately, it will be harder to avoid "The Omen"'s remake and the launch of hundreds of books, albums, parties with a "number of the beast" theme. Al Lewis sums it up nicely: "It's good day to hawk books, films, CDs, beer or anything else - because if there's a devil, he's got to love marketers". See his article. For more insights into 666. Cheyenne Morrison sells private islands for a living and has a blog. Just what the doctor ordered for a monday morning in the office. Create technorati tags automatically in Blogger with Greasemonkey script for Firefox. Cheeky monkey but if I can do it, so can you. It's simple and well explained. According to Mediametrie (French audience rating agency), 27.6% of French web users visit blogs at least once a month. . 4 millions wrote comments and 3 millions created their own blog. Most popular blog platforms are Skyblogs (from radio station Skyrock) with 4.17 millions visitors, followed by MSN Spaces (2.95 millions visitors), OverBlog (2.32 millions), Six Apart (1.87), Blogger (1.56) and BlogSpirit (1.3).